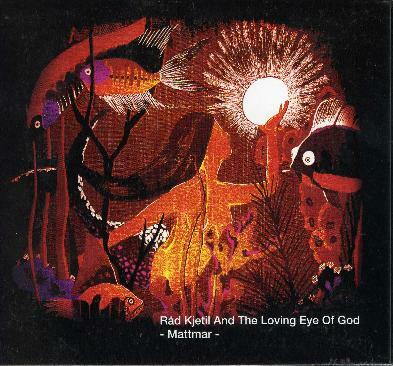 Råd Ketil and the Loving Eye of God - "Mattmar"
The mystery of who is playing in Råd Kjetil and the Loving Eye of God continues as the band release their third CD. Rumors have it that it is Jens, Arne and one other in disguise. Some day it will be leaked, like all top secret documents. Anyway, back to the 6 strange spaced out droning tracks on this new CD ranging from 7 to 12 minutes each (55 min total). It appears that these guys set up in the Space your Face studios in Umeå, took some good mind altering substances, could be tea, coffee, mushrooms, herb, alcohol, and improvised. The opening track is a slow going track with loads of stuff slowly bubbling in and out and up and out, including some spoken samples. It leads directly into Sen Ska vi se vad jag Sjunger, which has a very strange baby voice, coughing, beautiful guitars, and a very strange dream. Dry Air Static Sparks Northern Skies is next and starts with a heavy, cutting electric drone that washes your senses clean before it settles a little and some spaced out vocals and some cool string instruments are played. Far out. The title track is a 9½ minute journey with some cool string instruments and a heavy distorted bass line running through the track. Go tripping in India or something. Music for acid heads for sure. Fylgia is next and starts off slow and drony with small sounds fluttering in and out in the background. The sound starts to really flutter with delay and sounds quite psychedelic and spaced out halfway through the track and then ends somewhat like it started. The CD ends with the nearly 12 minute Tjälen, another trip through time and space.